The double-gourd was a popular form for snuff bottles, particularly at the Court. The subject, as on all Imperial enamels, is a unique design and every one is different. However, this bottle is one of a series produced in the early Qianlong period at the Beijing Palace Workshops with different combinations of flowers, part of a broader group of double-gourd-form bottles with floral decoration on a yellow ground. The series is decorated with various auspicious flowers and there are seven recorded so far. One decorated with blossoming crab-apple, prunus and roses, is illustrated by Moss, Graham, Tsang, The Art of the Chinese Snuff Bottle. The J & J Collection, no. 190, and which was sold in these rooms, 30 March 2005, lot 22. Two more are is illustrated in Snuff Bottles, The Complete Collection of Treasures of the Palace Museum, pl. 13. See also one illustrated by R. Kleiner, Chinese Snuff Bottles from the Collection of Mary and George Bloch, no. 14; one from the Edward Choate O'Dell Collection illustrated by B. Stevens, The Collector's Book of Snuff Bottles, no. 968 (also illustrated by J. Ford, Chinese Snuff Bottles. The Edward Choate O'Dell Collection, no. 100 and in the exhibition catalogue Snuff Bottles of the Ch'ing Dynasty, Hong Kong Museum of Art, 1978, no. 25, where no. 26 is also of the group); and one last example was acquired by Hugh M. Moss Ltd. in the early 1970s (Hugh Moss records). 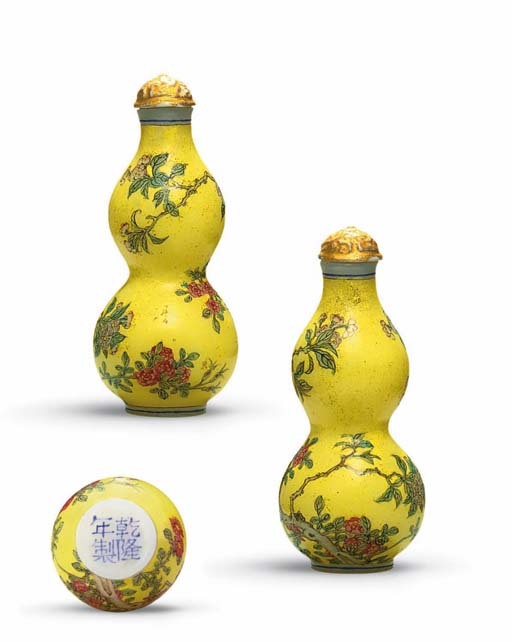 Other examples with floral decoration on a yellow ground but not part of this series include two illustrated by Moss, Graham, Tsang, The Art of the Chinese Snuff Bottle. The J & J Collection, 1993, pl. 189 (decorated with morning glory vines and bats) and pl. 191 (lilies and roses) and another sold in these rooms, 27 November 1991, lot 110. Enameled glass snuff bottles are very rare when compared to the number of metal and porcelain enameled bottles, most likely because of the difficulty in controlling and firing the enamels perfectly on glass, discussed under lot 617. It is interesting to note that when Ye Bengqi perfected his art of enameling in the 1930s, he would fire some of the enamels several times, adding a layer each time (see H. Moss, "The Apricot Grove Studio. The Ye Family of Snuff Bottle Artists", part 3, JICSBS, Autumn 1985, pp. 116-130). Although it is not certain that the Ye family arrived at the same solution as the Beijing Palace Workshops more than a century earlier, it is likely. The double-gourd was a popular form for snuff bottles, appreciated not only for its tactile qualities when held in the hand, but for its auspicious symbolism, representing abundance and its association with Daoism. The gourd growing on a vine formed the rebus guadie mianmian ("May you have numerous descendants").